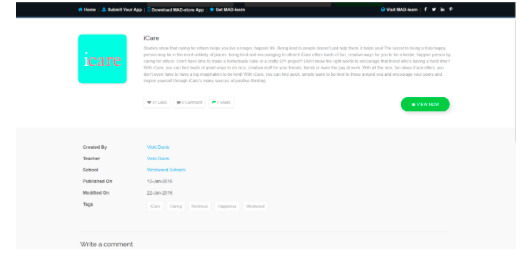 MAD-store is the go-to place for all apps created via the MAD-learn platform. Students have the opportunity to publish, view and share their apps on PCs, tablets or smartphones, in both iOS and Android environments. Why did we build the MAD-store? We all excel when our hard work and creativity is recognized and appreciated. The MAD-store provides students the opportunity to not only show off their hard work but also gives others (parents, peers, the greater community) the opportunity to view, use and appreciate their work. This is a great way to boost students’ confidence and help them collect valuable user feedback to improve the app that they built. It’s a repository for student-created apps. 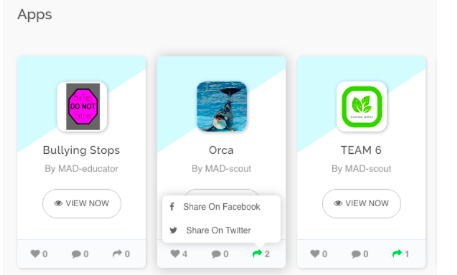 Now every student can see every app they create immediately, with the added ability to share with their selected audience. Apps on the MAD-store can be used as references or a guide to create other apps. It’s free! Any student app can be published on the MAD-store and viewed and used for free. Publishing your app on the Apple App Store or Google Play Store can become price-prohibitive for schools to utilize. So we made the MAD-store just for students! It’s rare: we realized that the opportunity for students to create and effectively share their apps with a global audience was rare. It’s REALLY COOL! The ability to see the new mobile app that you just created instantly on your phone is such a joy. We wanted to make sure every student and teacher could have this amazing experience. The latest version of MAD-store includes a more intuitive and simple homepage. This allows you to quickly navigate through the MAD-store website and explore hundreds of student created apps. 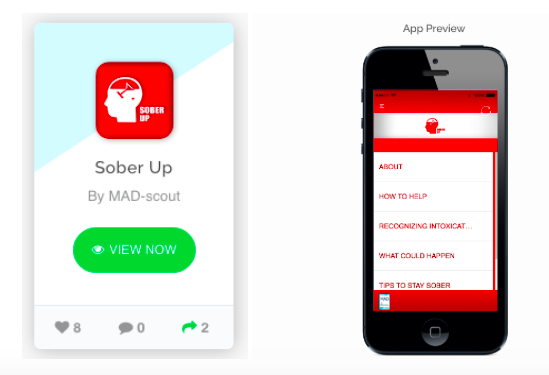 The new Search feature allows you to search the apps with the Preview Code generated through the MAD-learn platform in order to view and showcase a fully functioning version of your app to others. You can also search apps using any keyword or school name. The most exclusive student created apps are showcased in our Featured Apps section. These apps have been rewarded for being some of the finest student work and typically have been the winners of local or global MAD-shark tank competitions that have been conducted. The App Details page tells you more details and information about the app. Here’s where you can learn about the idea and concept behind the app and what the app developer has tried to accomplish with it. See something you like? Share it! Like it! Help students know their work has meaning and has an authentic audience. You can like an app or share it on Facebook and Twitter to motivate and encourage student effort and hard work. If you wish to leave direct feedback or appreciation for a particular app, you can use our comment section. Your feedback and kind words will allow the students to improve on their app and remember the need to always be innovating. Don’t forget to download the MAD-store appon your phone or tablet from Apple’s App Store or Google Play Store to get free access to student-made mobile apps from around the world. Let us know what you think!